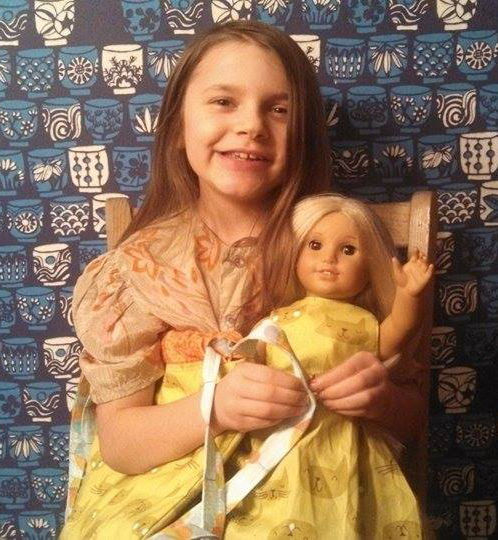 This Christmas, my sweet niece Stella was the recipient of some of my homemade gifts. 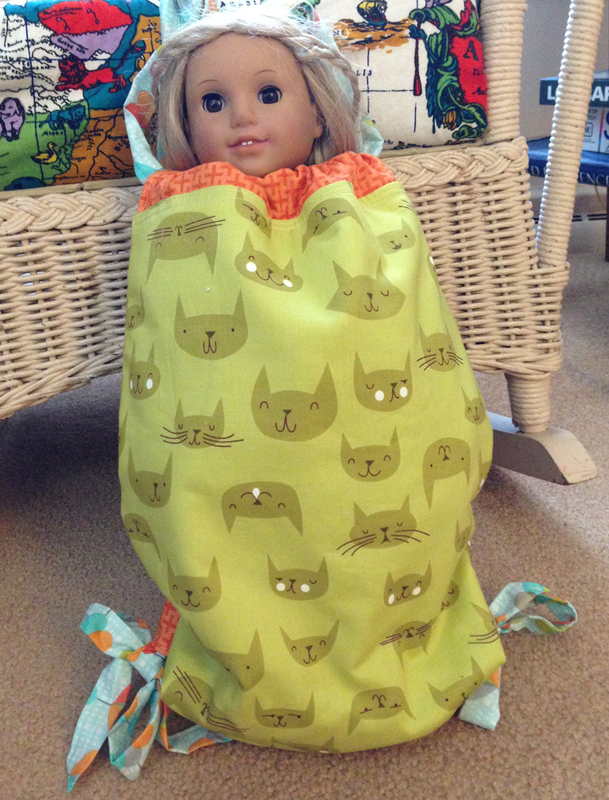 Stella’s still very much into her American Girl doll, Julie, so I decided to try my hand at making a doll dress. After a bit of searching, I found this dress pattern from All Things with Purpose. 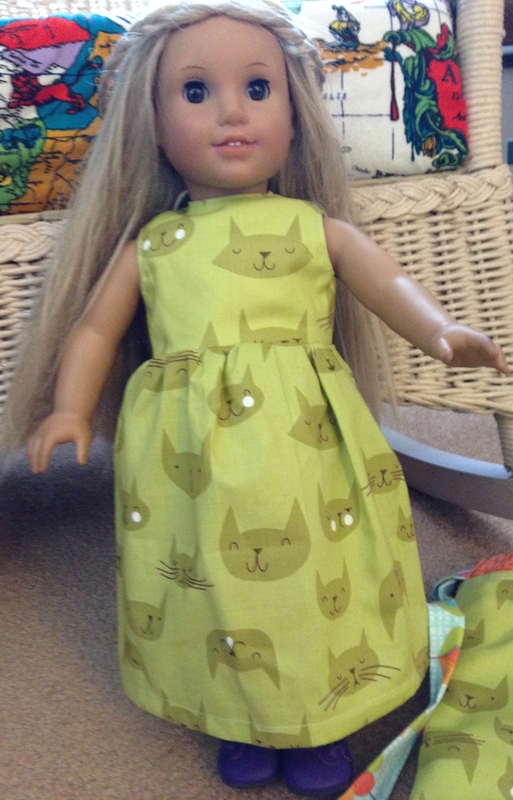 Several years ago, I had edited a book titled All Dolled Up by Joan Hinds about making clothing for 18″ dolls, so I had some idea of what the process would be. While the pattern recommended using a tie to close the dress in the back, I decided to add some narrow strips of Velcro to make it easier for Stella to secure the dress. 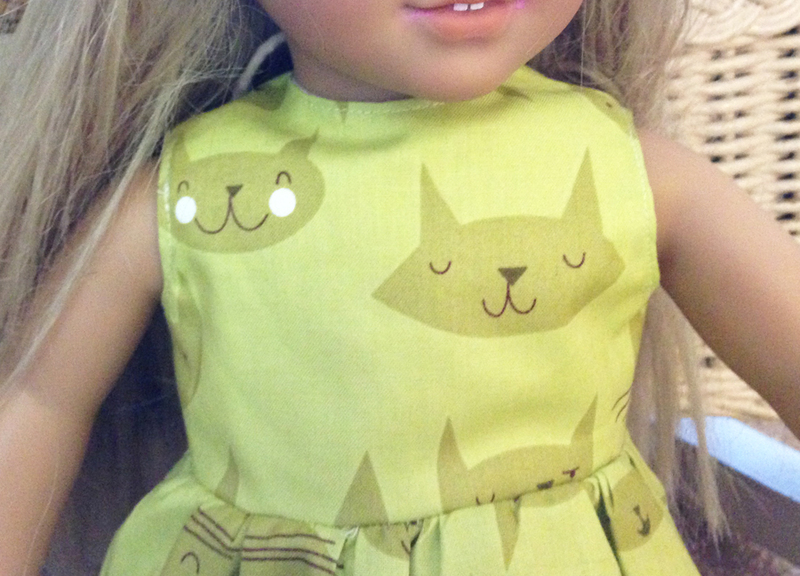 I also added top stitching around the neck and armholes, just because I think it makes the dress look more finished. 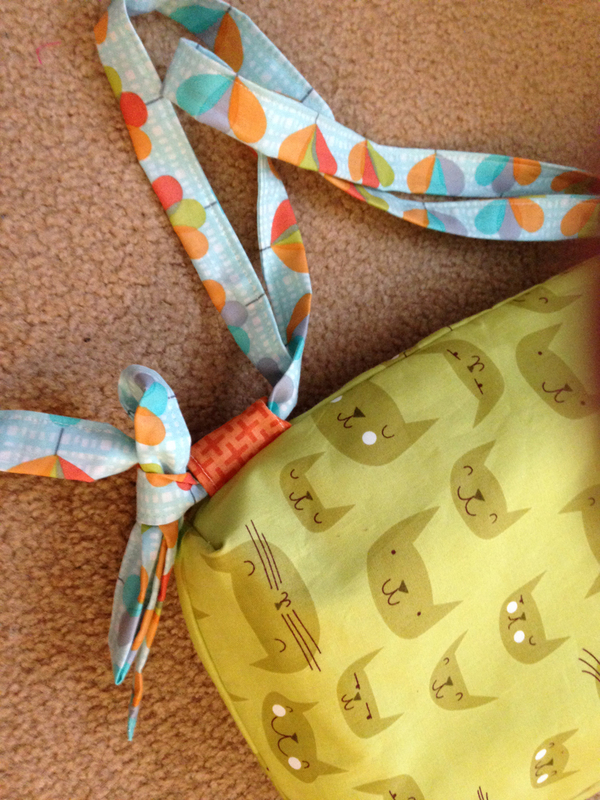 Since I had plenty of kitty fabric left, I decided to make a little backpack for Stella to use. This pattern I got from the book Because I Love You Sew by Trish Preston. The book was one of the many awesome swag items I received at the OHCraft sew-in in October. The backpack was meant to be used by a small child. 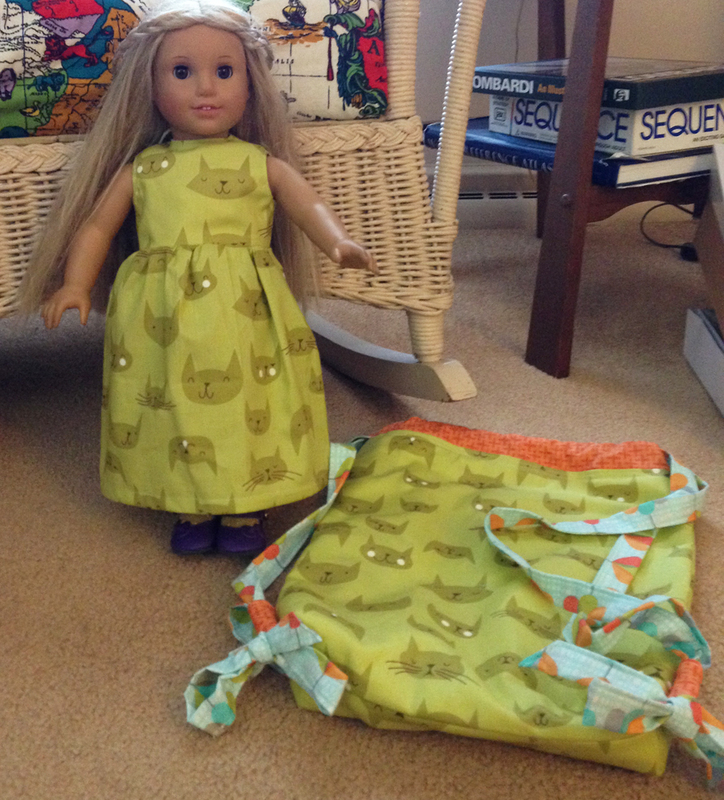 But it wasn’t until Stella received the bag that she realized it fit Julie perfectly! Her little face just pokes out of the top. The closure on the backpack is a bit unusual. The straps cinch the top closed, form the straps of the backpack, and then lace through tabs at the bottom of the backpack and are tied with a bow to secure. That’s a bit complicated for a seven-year-old, but hopefully Stella will get the hang of it. For the first few blog posts of the new year, I’ll be playing a bit of catch-up. I sewed quite a few gifts this Christmas, and now that everything is with its new owners, I can share them here. 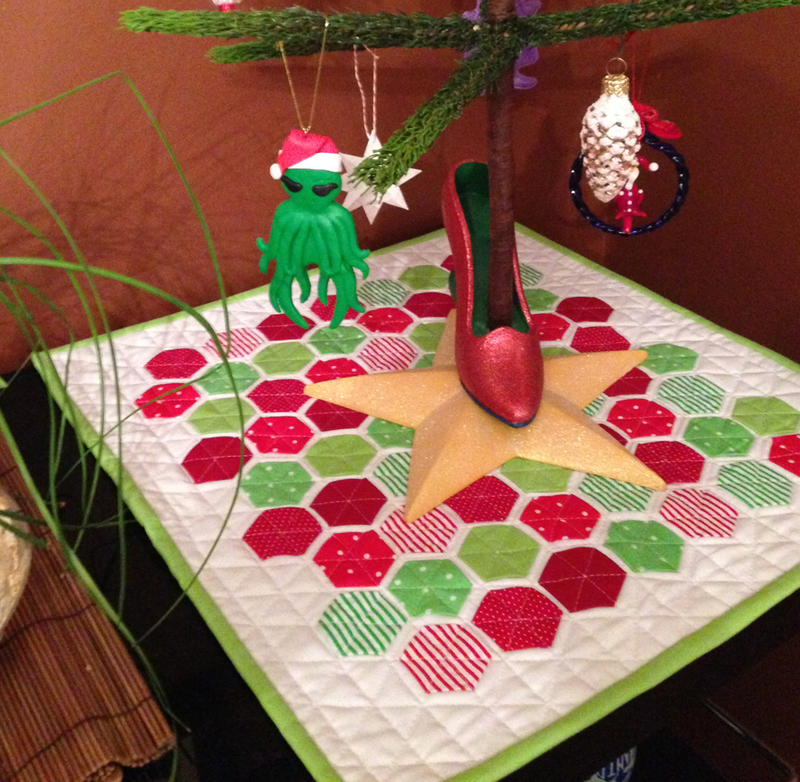 First up is the Christmas table runner I made for Annie of the Cincinnati Modern Quilt Guild. At the November meeting, those of who wanted to participate filled out a short survey as to what fabric we liked and what our ideal swap gift would be. 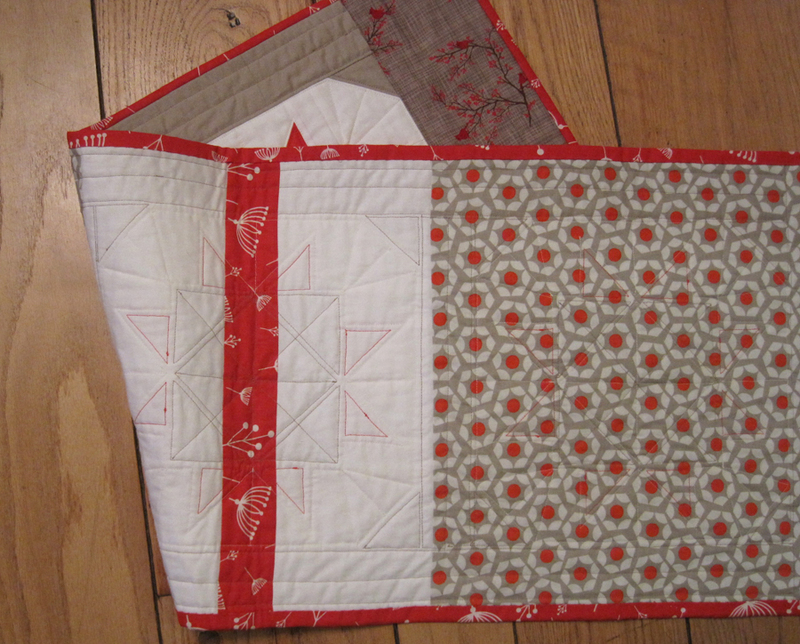 I received Annie’s name, and she said she liked Cotton + Steel fabric and wanted a holiday table runner. I got a bit of a slow start on the project, and I didn’t have time to order any fabric for the project. So I stopped by Sewn Studio to see what they had for Cotton + Steel. They had several fabrics from the line, but nothing looked remotely Christmasy. So I decided to make it a low-key Christmas. I picked up some tan and red Cotton + Steel, as well as some red Charley Harper fabric. 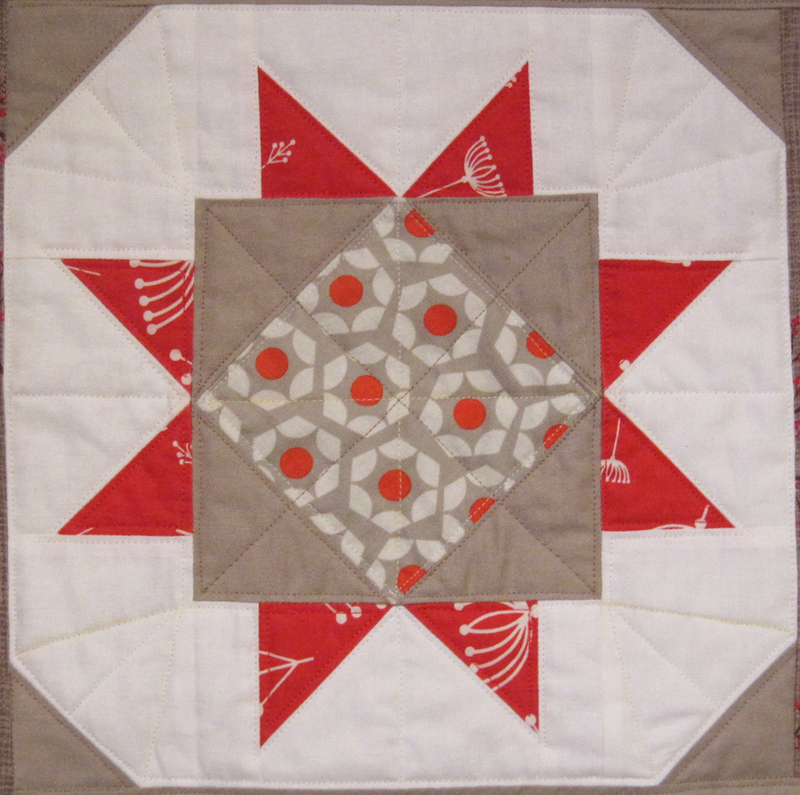 The star block I went with is from the book Modern Blocks by Susanne Woods. It’s my go-to book for these kinds of projects, and this has become one of my go-to blocks. 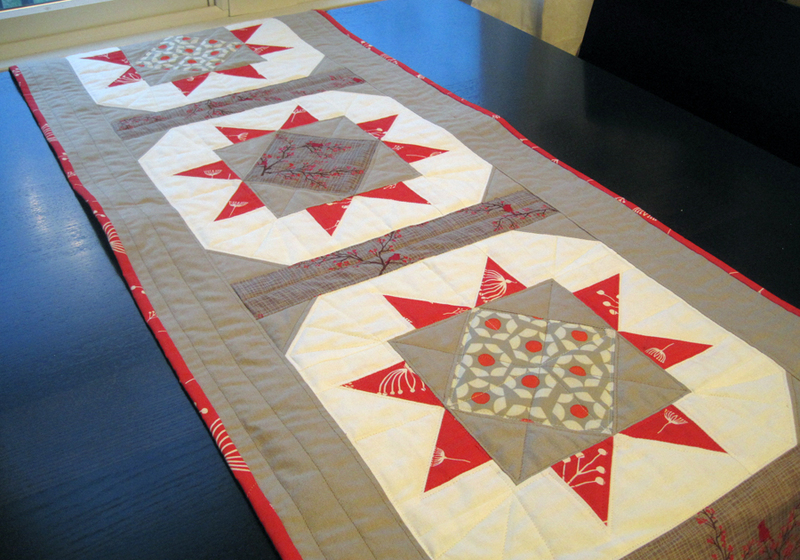 To mix it up a bit, I added a wintery tan and red fabric from my stash for the center block and sashing fabric. The quilting on the table runner caused me some fits. For some reason, my machine insisted that the thread in bobbin be the exact same as the main thread. Not just the same brand, but the same color, too. The tension was completely off unless they matched. Needless to say, that wasn’t what I had planned for the look on the back of the table runner. But, as I mentioned, I was a bit behind schedule-wise, so that’s the way I quilted it. 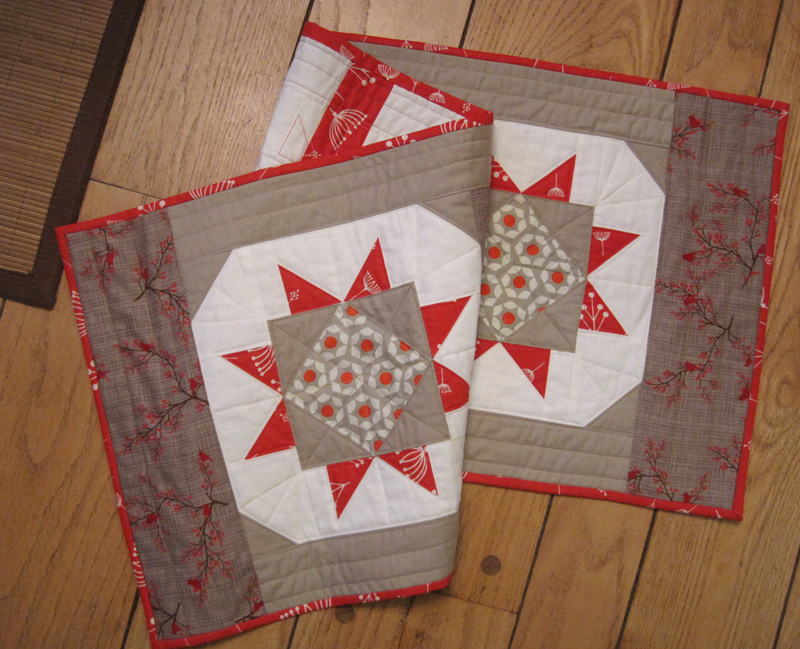 Even then, the quilted ended up being on the light side, as are most of my projects. 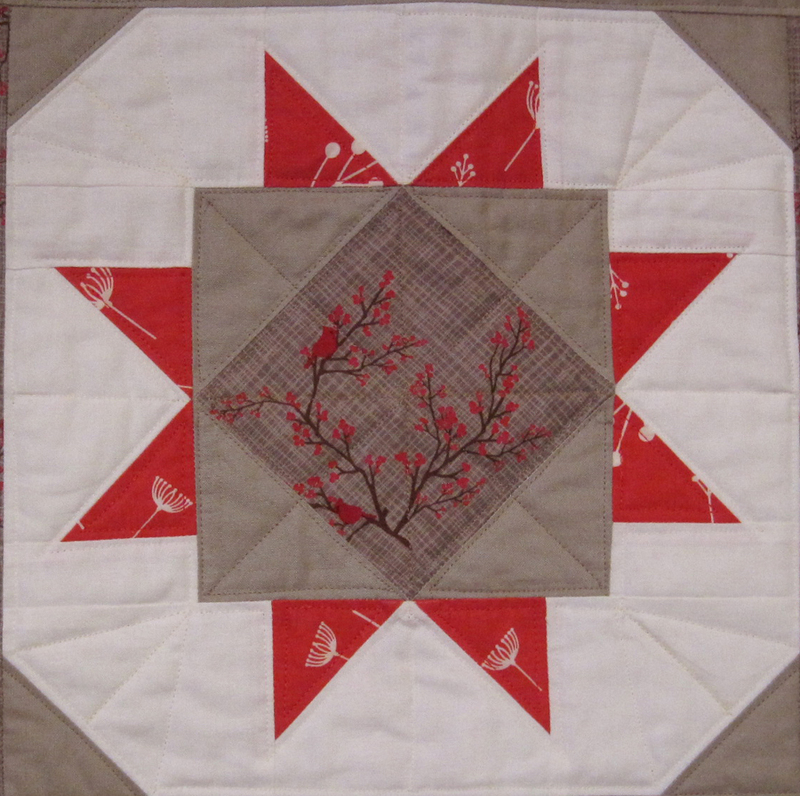 But this year, I’m thinking I want to resolve to make my quilting a bit denser. We’ll see. At the December CMQG meeting, I gave my gift to Annie, and I received a gift from Wendy. Wendy recently gave a talk to the guild about making hexies, so I was pleased that the gift she gave me was filled with them! 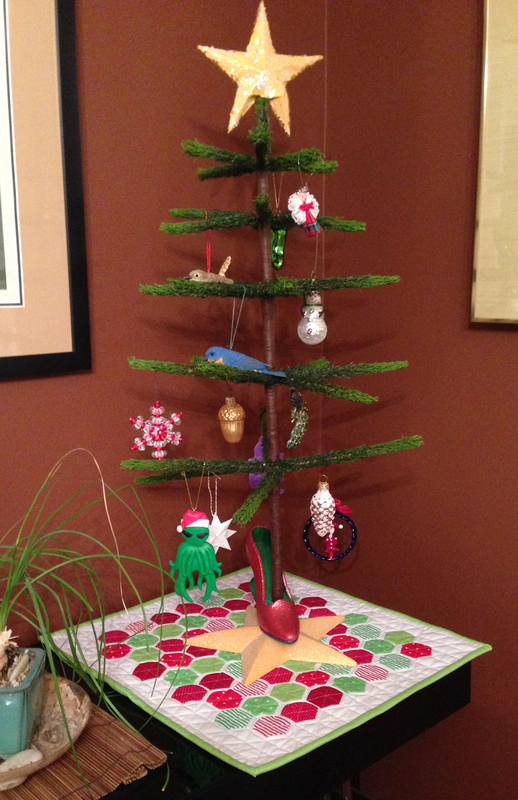 The table topper fit perfectly under our shoe Christmas tree. And it couldn’t have matched Greg’s Cthulhu ornament any better. Thanks, Wendy!